With heart disease the #1 killer in the US and KY ranking second nationally in mortality because of it, it’s imperative that the Commonwealth possess a comprehensive facility to address cardiac issues. The collaborative culture at the UK Gill Heart Institute all but ensures it will fill – and exceed – that critical role. UK’s commitment to translational science – the process of turning a basic science discovery into applications for human patients – provides context for all the work performed there. Since its inception in 1997, the Gill has had a commitment to providing excellence in cardiac care, education of the population, and outreach to other medical facilities. In that time it has made its mark on the state. Its fourth commitment, to research and innovation, however, forms the context for the others. “Research and innovation are the platform that drives everything we do. It enlightens our approach to patients, to education, to outreach,” says Director and Chief of Cardiovascular Medicine Susan S. Smyth, MD, PhD. How this research and innovation takes place is just as integral to Gill’s success: collaboration between physicians and scientists are at its heart, producing the lifeblood of the Institute. Translational science requires doctors, researchers, and staff to work together to produce the “bench-to-bedside” successes that are being experienced at the Gill. “Those of us at the Gill feel very passionately that we want to make a difference, not just to our individual patients, but more broadly to cardiovascular care,” says Smyth. The process of moving research discoveries to health care solutions gains dynamism and speed when it happens beneath one roof. Although the enthusiasm and pride such successes have engendered at the Gill is palpable, faculty and staff are resolute in their belief that there are always areas open to innovate and improve and to impact health care beyond the state’s borders. Smyth can cite many areas where “we are having a national impact and changing cardiovascular care -not just in Kentucky, but across the country.” Five of them are profiled below. Nuclear stress tests and ultrasound are the traditional tools for cardiac imaging, but state-of-the art MRI scanners and CT scanners, which require special utilization to produce good heart data, are increasingly employed at the Gill. “Just because you have an MRI scanner doesn’t mean you can see the heart. You have to invest a lot of effort and resources and money to see this thing that beats 100,000 times a day,” says Sorrell. For Sorrell and his clinical team, their main preoccupation is determining the “best first test” for each patient so that down the line, fewer tests are needed. Sorrell relies on physicians like Fornwalt and Leung, who create new imaging tools and even advise the scanner’s imaging programmers on how their software can better serve clinicians and produce new testing options. Vandesberger is the go-to-guy for providing heart imaging all the way down to the cellular level. Vascular surgeons David Minion, MD, and Eric Endean, MD, are pioneering the use of grafts to repair aneurysms. Their work relies directly on the groundbreaking research conducted by the Gill’s Alan Daugherty, PhD, DSC. Daugherty has created a model of aneurysm development in mice and is demonstrating how to prevent aneurysms from growing or rupturing through grafting. Endean says Daugherty’s work has advanced his and Minion’s abilities to treat complex aneurysms with an endoscopic approach, “pushing beyond what grafts are typically supposed to do by using components of the grafts to treat more complex disease processes.” The endoscopic approach is key for patients with multiple co-morbidities for whom major surgery is highly risky. Recently they treated a former Cleveland Clinic patient whose severe aneurysm was deemed to be unrepairable. The team successfully modified the grafting process and was able to stop the aneurysm from rupturing. Endean notes that Minion is getting more of these kinds of referrals, “patients who have been treated at other institutions and have no other options are being sent to him to see if something can be done.” Such successes are integral to effectively treating modern-day cardiac patients, as they increasingly have multiple health problems, many of which are due to the very high incidence of smoking, obesity, and diabetes in Kentucky. Endean acknowledges that his work with Minion, in pushing boundaries of aneurysm repair, has been made possible by the Gill’s openness to innovation: “The uniqueness of UK is that we have the spectrum. We have people who are at the forefront of [examining] aneurysm development and repair, and we have surgeons who can have cross-talk with them. Surgeons can go back to the scientists and say, ‘These are the things we struggling with.’” You could call that the “bench-to-bedside-to-bench” approach. Smyth started out planning to be a hematologist. Her interest in platelets was piqued by the first big aspirin study in the 1980s, which demonstrated that platelets played a role in heart disease and pushed her towards cardiology. “I realized that if I wanted to target platelets and make a difference, the place to do so was in cardiology.” Her studies have revealed how integral platelets are to a series of body processes, from the lymphatic system, arthritis, and migraines to pneumonia and sepsis. Her work on antiplatelet agents at UK has allowed her lab to serve as a core lab for some of these large trials to look at some of the basic changes in platelet function. Their findings are then applied back to the large (20,000 patient) trial. One area she is currently investigating is how platelets may exacerbate pneumonia. By examining the Kentucky Medicaid database, she and fellow researchers found data to suggest that patients who presented with pneumonia while taking antiplatelet medications may do better than pneumonia sufferers who were not on any antiplatelet drugs, which was sufficient to launch a study. Her group at UK has now begun an investigative trial to determine if one of the new antiplatelet drugs may actually improve outcomes. The value of UK’s culture of translational science and the Gill’s culture of multidisciplinary collaboration are also exemplified in the experience of Michael Sekela, MD. Sekela is a heart surgeon who recently migrated to regenerative medicine and stem-cell experimentation. Along with Ahmed Abdel-Latif, MD, PhD, an interventional cardiologist who delivers stem cells to patients in the catheterization laboratories and studies the role of stem cells in heart repair, he is embarking upon an experiment with the potential to reverse the decline of failing hearts and that may bring hope to cardiac patients who have exhausted all their options. Sekela recently returned to the University (he helped launch UK’s heart transplant program in the early 1990s) from private practice to serve as senior heart surgeon at the Gill. He saw the move to UK as an opportunity to advance the field of cardiac surgery in a way he could not do in private practice. 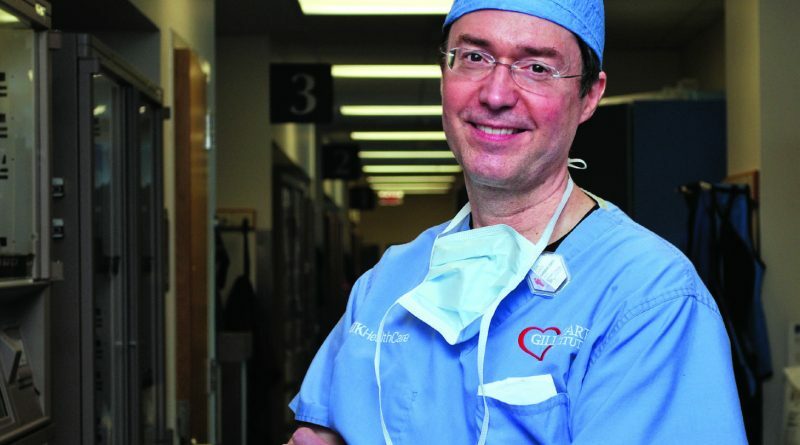 His years of operating on weakened hearts compelled him to consider innovative techniques to strengthen areas of heart tissue that were inducing heart failure. The stem cell protocol is awaiting FDA approval. Following that, the initial local trial would take about two years. Should all go as planned, Kentuckians for whom everything has been tried, would have another option to increase the functionality of their failing hearts and improve the quality of their lives. 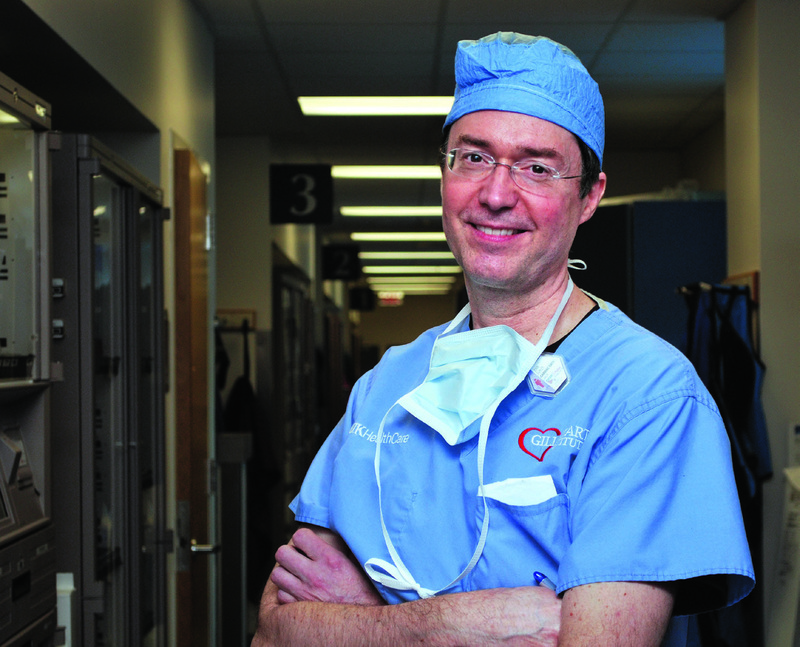 Doing things no one else has could be the motto of John Gurley, MD, director of the Gill’s Interventional and Structural Heart Program. The Gill’s cath labs, where MDs training to be interventionalists work side-by-side with Gurley and others, is ground zero for advanced catheter-based therapies. The success of the Gill rests on the attitudes and passions that are producing these bench-to-bedside success stories, but the Institute excels in other ways, too. The Gill has become a regional leader in outreach, developing relationships with regional providers like Appalachian Regional Healthcare System, Clark Regional Medical Center, and Georgetown Community Hospital, among others. Smyth explains, “We are teaming with providers at the grass-roots level to keep patients close to home. In each community the approach is different because each community has a slightly different need. Our role as the academic medical center is not to duplicate heart care that is available closer to the patient’s home town, but provide the services for more complicated heart problems so that no patient ever has to leave Kentucky for cardiac care. That is better for the patient and more cost effective for everyone.” Smyth credits Rick McClure, coordinator of Outreach Services for the Gill, as the architect of this initiative. National prominence is increasing in many ways. Awards have come to several doctors this year: Jacquie Noonan, MD, was named educator of the year by the American College of Cardiology; Mikel D. Smith, MD, will receive the Richard Popp Award for Excellence in Teaching at the meeting of the American Society of Echocardiography in June; and Fornwalt was the recent recipient of the prestigious National Institutes of Health Director’s Award, given to only a handful of extremely promising young investigators every year.